Home » Animals » Art » Australian Author » Humour » Picture Books » Reviews » Reviews by Susan » Susan Whelan » Review: Wait! No Paint! 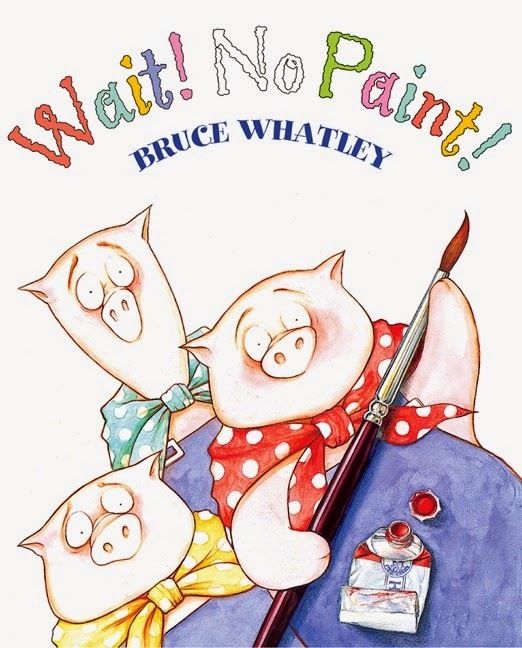 The familiar story of the three little pigs gets a hilarious makeover thanks to favourite Australian illustrator Bruce Whatley. This version has one extra character as the illustrator himself gets involved in the story, spilling juice on the drawing of the straw house, running out of red paint and generally preventing the story from running along the expected path. Wait! No Paint! is one of our family favourites. It was often requested when the kids were younger and still ranks as one of my daughter’s favourite picture books ever. It’s sure to be enjoyed by all children, but will hold special appeal to young artists as the illustrator experiments with paints to make up for his low supplies of the all-important ‘red’.